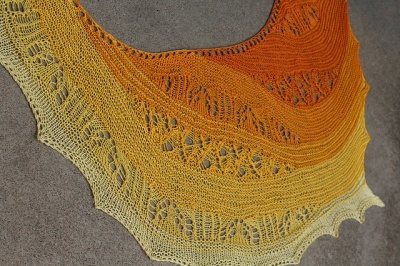 The original shawl, as knit in Golds. Only the blue color set is left! I totally fell in love with this. 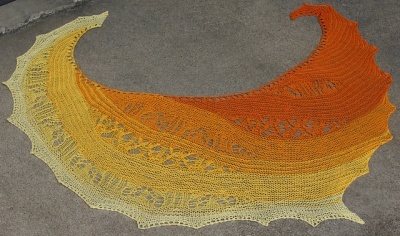 And when I realized that I could get in the exact yarn that was used by Pam Jemelian in the original Tahitian Sunrise, well, the rest is history as they say. 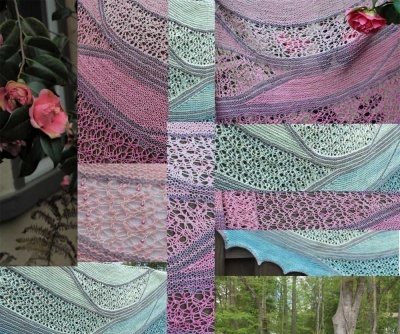 Please make sure to get the pattern itself from Pam on her Ravelry page. We offer here the yarn for this beauty but only the yarn. Breaking over the clear turquoise water each morning in ombre shades of orange and yellow, the Tahitian Sunrise fills the sky with its glory. 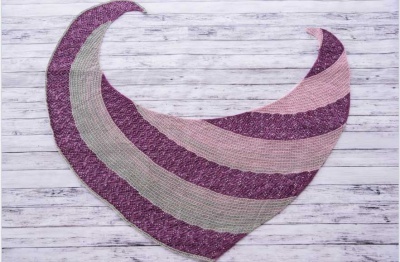 The Tahitian Sunrise Shawl is an asymmetrical bias-knit shawl that incorporates lace inserts into its design as the shawl grows. It simultaneously builds an ombre color story from the darkest shade at the cast on and graduating to progressively lighter colors until casting off on the longest side. I used a sport weight yarn to knit this in, but you can choose any weight since it is a very flexible pattern and can be worked to any size. 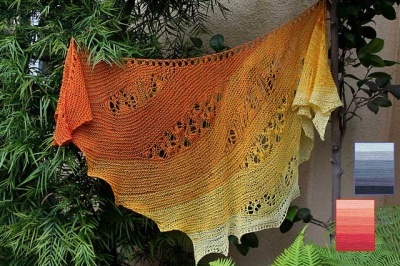 I used the Katia Ombre Cotton Set in the Orange/Yellow colorway which had 6 small skeins totaling 552 yards. 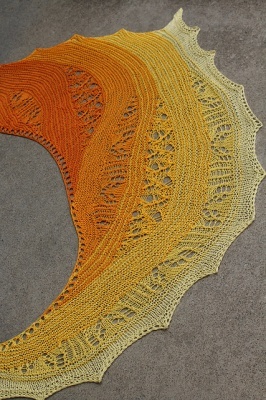 My finished shawl is 6 feet in length and 24 inches at its deepest point. Full written instructions are included in the pattern as well as charts and row counts for the lace inserts. 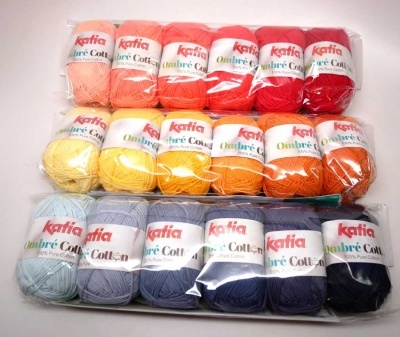 The yarn we have for these kits is exactly as Pam writes above: 100% cotton made up of six small balls, each set of 25g and having 107 yards. So each set of yarn gives you 642 yards of beauty. 1. The Golds: This is the same set of golden yellows that you see in the original, ranging from a pale pale sunlight through ever deepening tones to end in apricot. 2. The Reds: All gradually changing variations on red. Ooomph! This goes starts at a soft apricot and deepens into peach and finally into a true red. 3. The Blues: Cool and clear as a mountain stream, perhaps for just about all skin tones and looks, here are a wonderful blend of blues, gradually changing. They go again from a pale tone into deeper hues and ending in navy. *And if you agree with me that Tahitian Sunrise is awesome (! ), remember to get that pattern here.